Eating these for breakfast will spoil your appetite. Permanently. The last time I made these waffles, I didn't have enough self control to snap a photo. If you want a hot crisp waffle, there is simply no time for photography. I planned to make them again for a late brunch this morning. But I forgot that it was Fast Sunday, the once monthly appointed day for abstaining from two meals and donating the saved money for needs in the community. It is very easy to fast when you planned to have a bowl of oatmeal for breakfast. It is very, very hard to fast when you planned to eat chocolate waffles. Plus, what about my responsibilities to my readers? Didn't I promise a full report, recipe, and pictures? I had two out of three, so I resorted to borrowing a photo off the Internet. Thank you, Colorado State Fair, for your lovely, artistic, and tempting photos. I'm packing up this morning for a quick trip up to Provo, Utah to visit my little sister and her rosy, fat babies. You won't even know I'm gone, since I'll post from there. I have to post, since I have news that involves West, a jar of peanut butter, and national TV. Heat a waffle iron according to manufacturer’s directions. Sift flour, cocoa, sugar, baking powder and salt into mixing bowl. Whisk together milk, egg yolks and oil. Add to flour mixture and whisk gently just until combined. In clean, dry bowl, whisk egg whites with hand held beater until they form soft peaks. Fold into batter, with chocolate chips, if using. Ladle one-third of the batter onto the center of the waffle iron. Close top and cook until the waffle is crispy on both sides. Repeat to make 3 waffles. Serve immediately. To make chocolate sauce: In a heatproof bowl set over a saucepan of simmering water, melt chocolate with cream, stirring occasionally until smooth. Keep warm, or reheat before using. 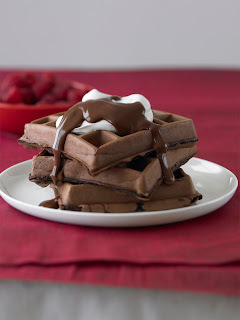 Drizzle waffles with chocolate sauce and garnish with seasonal berries and whipped cream. Whoo Hoo! Chocolate breakfast food. NOW the world is perfect. I use the phrase, "to die for" all the time". My cutie pie son cracks back, "well, maybe not to die for, but I'd give a leg for it". I'd give a leg for these waffles! Oh. My. Word. They look divine! oh dear wish i hadn't seen these. this is all things chocolate heaven. Those gave me a cavity looking at them! Oh my, those looks divine. Want! YUM! that's all I have to say! Chocolate is the best, so any way I can start the day with it works for me! Looks like a great dessert offering as well. can't wait to hear about West's contest. Those waffles are sooooo decadent! Wow!